University of California Press, 9780520209350, 596pp. For generations, scholars have focused on the rise of the Greek city-state and its brilliant cosmopolitan culture as the ultimate source of the Western tradition in literature, philosophy, and politics. This passionate book leads us outside the city walls to the countryside, where the vast majority of the Greek citizenry lived, to find the true source of the cultural wealth of Greek civilization. Victor Hanson shows that the real "Greek revolution" was not merely the rise of a free and democratic urban culture, but rather the historic innovation of the independent family farm. The farmers, vinegrowers, and herdsmen of ancient Greece are "the other Greeks," who formed the backbone of Hellenic civilization. It was these tough-minded, practical, and fiercely independent agrarians, Hanson contends, who gave Greek culture its distinctive emphasis on private property, constitutional government, contractual agreements, infantry warfare, and individual rights. 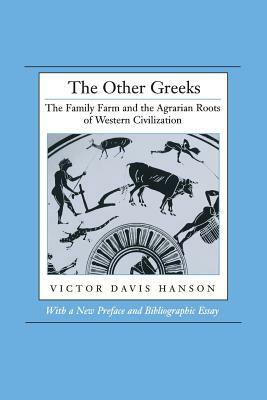 Hanson's reconstruction of ancient Greek farm life, informed by hands-on knowledge of the subject (he is a fifth-generation California vine- and fruit-grower) is fresh, comprehensive, and absorbing. His detailed chronicle of the rise and tragic fall of the Greek city-state also helps us to grasp the implications of what may be the single most significant trend in American life today—the imminent extinction of the family farm. Victor Davis Hanson is Professor of Classics at California State University, Fresno, and author of Warfare and Agriculture in Classical Greece (Revised edition, California 1998),The Western Way of War: Infantry Battle in Classical Greece (1986), and Fields Without Dreams: Defending the Agrarian Idea (1996).